Flo Peters and her husband Bill have monitored lots of water and influenced many, many others to do the same! Both have been recognized over the past several years for their outstanding efforts in watershed stewardship and environmental education. Flo with her faithful testing partner Ernie at their beloved Fogle Lake. Bill, along with Gene Grimes, were recipients of the 2013 AWW Restoration and Protection Award for their monitoring and stewardship efforts in the Cahaba River (see http://wp.auburn.edu/aww/and-the). Sadly, Bill passed away in October of 2014. His legacy of environmental stewardship lives on, through the dedicated efforts of Flo and Gene and Dorothy Grimes, who were the recipients of AWW’s 2015 Environmental Educator Mentoring Award. Along with becoming AWW trainers, they played a major role, working with 4-H AWW Program coordinator Mona Dominguez, in launching the 4-H AWW Program on a statewide scale (see http://wp.auburn.edu/aww/2015-aww-award-winners). Then, in 2016, guess who was the mover-and-shaker behind the first-ever 4-H AWW Club of the Year Award recipients? Yep – Miss Flo! The 4-H AWW Washington County Club began in April 2015, thanks to Flo encouraging her brother, HB Taylor, to start monitoring with his granddaughters in their hometown of Chatom (see http://wp.auburn.edu/aww/2016s-award-winning-water-watchers) YOU GO FLO! 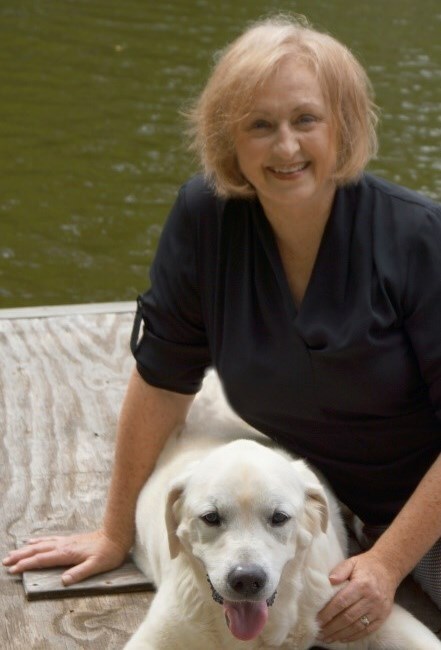 Home is near Alabaster on my favorite body of water – a 28 acre lake. I was reared in Washington County where I grew up with six brothers. Their influence of the outdoors and nature led me to major in biology at Samford University. Later, I entered the field of science and retired from UAB Hospital after serving as manager of Hospital and Kirklin Clinic Laboratories. 2. What water recreation/sports do you enjoy most? A clean lake equal tasty fish for the dinner table! 3. 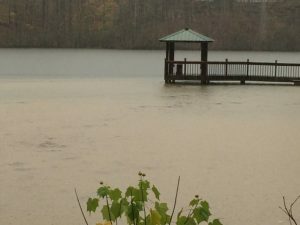 What got you interested in Alabama Water Watch? I can’t help but smile as I write this on Earth Day 2017. Being an ardent environmentalist, Bill became interested in AWW and encouraged me to participate in its vision and goals. We both became monitors then trainers and active watershed stewards. In the past two years, my efforts have been channeled through our church’s Green Team and its mission: “ … to care for people and creation.” In 2008, the care of creation became a central part of the Montevallo Presbyterian Church’s Green Team. AWW’s mission to educate and train students and citizens to improve water quality and policy became a mutual goal. As a result of these efforts, our church was later certified as a national Earth Care Congregation for environmental stewardship achievements in education and outreach actions. The Green Team now supports and works closely with AWW. In addition to AWW workshops for certification, I get inspiration from those who show an interest to broaden their knowledge of water quality. We formed a partnership with the University of Montevallo’s Environmental Club to provide ongoing certification to students; in addition we assisted Mona in developing the 4-H AWW program. 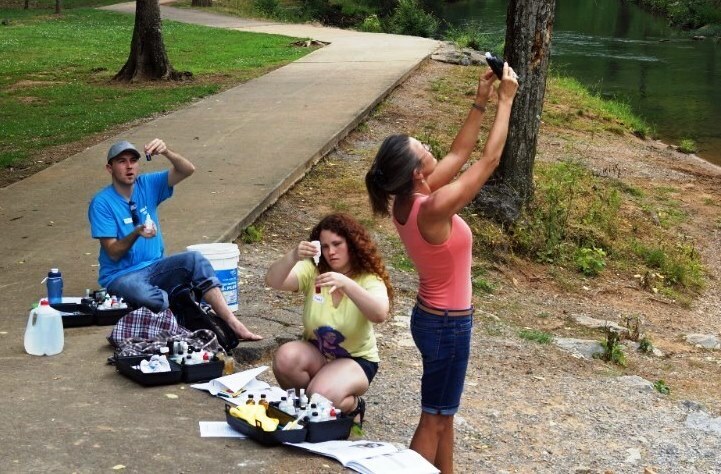 University of Montevallo Environmental Club members Ryan Ahrendt, Haley O’Brannon and Tara Carter, testing the waters of Shoal Creek in Montevallo. There are other interested students outside workshops: boy/girl scouts; home school students; foster care children; grandchildren of friends; and public school classes. There are times the cost of a kit may prohibit a family from monthly testing. When this occurs – and if a student shows interest – I take the opportunity to encourage them to learn about water quality. Often I invite them to the lake. It’s a chance to have fun and learn in a practical setting. On such occasions, I have explained why erosion is the number one problem and how we corrected it in our lake. Oxygen was discussed when we had a fish kill during the drought. Showing the student a 40 lb. bryozoan grabs the attention! 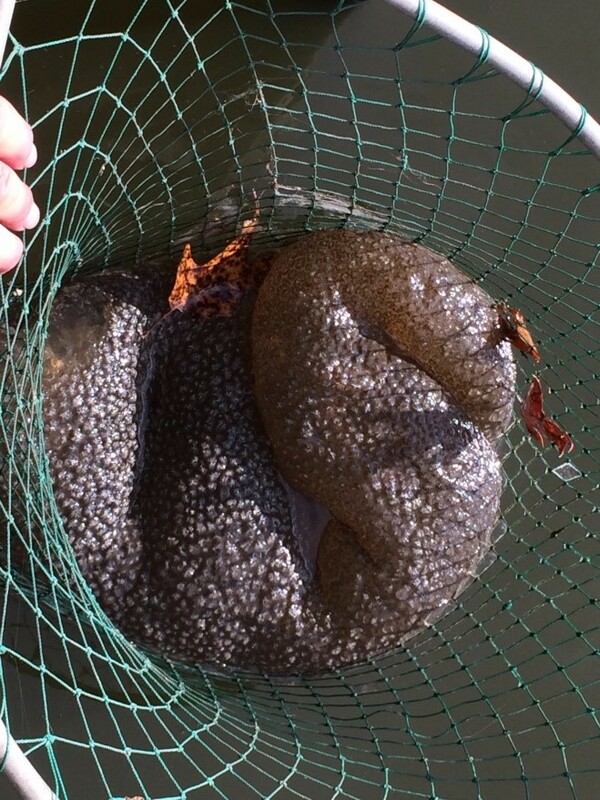 (When fishing, they now look for bryozoans.) At one time a small ditch had a rusty-orange appearance; an opportunity to discuss how particles in water, such as iron floc, influence color. It’s not the ‘Blob’ it’s a Bryozoan! 4. What are your biggest challenges/issues in your favorite watershed? The Fogle Lake Association stewards our lake through AWW water chemistry and bacteria monitoring. Our greatest challenge is to manage cost and keep a momentum for water testing. Through AWW training and certification, we have tested the lake since 2009. By gaining this knowledge, we have managed our own lake with minimum outside management costs. We have developed a healthy, well-balanced lake with an estimated cost savings of $8,000! It takes time and passion to keep others interested in the task. What the lake monitors don’t like to see – a muddy lake from eroded soil from the landscape carried to the lake by stormwater runoff. 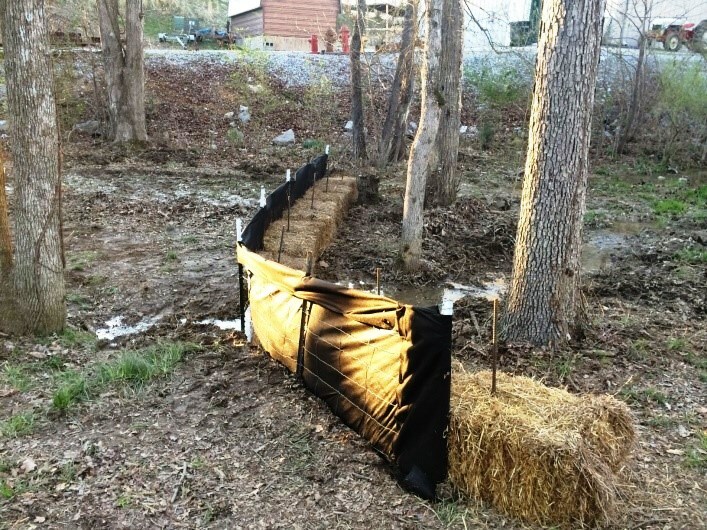 Methods employed by watershed residents to prevent eroded sediment from fouling the lake. 5. 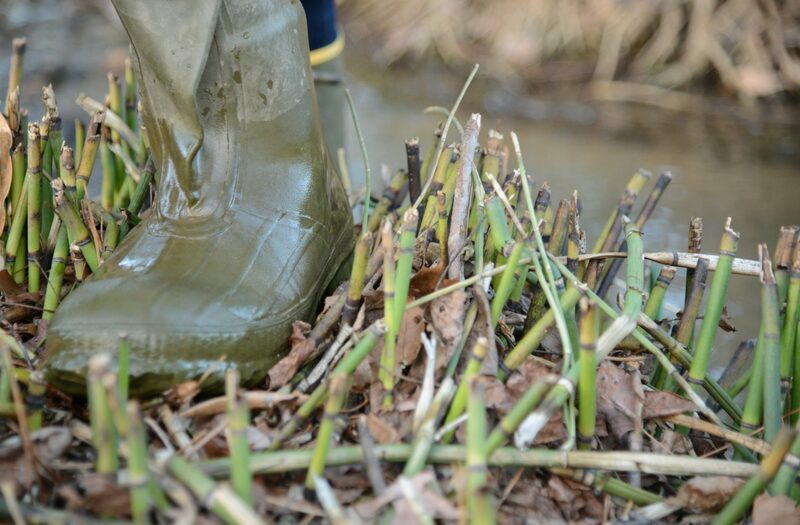 Do you have some ‘lessons learned’ that you could pass on to the rest of us relative to watershed stewardship? E.O. Wilson’s Biodiversity Foundation quote: “Learning about the environment is the first step to preserving it” sums it up nicely. AWW is committed to the same principle for water quality. Whenever and wherever possible, we must: provide an opportunity and teach those who are interested to be good stewards of their watersheds. 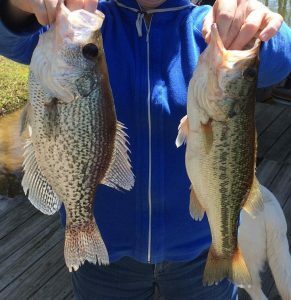 TEST THE LAKE – THEN FISH THE LAKE: Calera High School seniors Blake Pilgrim and Jacob Dotts learn the value of a healthy lake through AWW water training and testing.